Or rather, DarkerSide Had Science Done To Him, which is less dramatic but more accurate. Sally (of City Exile fame) had passed on a request from Emma Bill, who was after volunteers to watch some cycling videos in support of her PhD. Always a sucker for a £20 shopping voucher (probably stretching the definition of volunteering, somewhat), I’d put my name forward. Sadly there was an embargo on recruiting by social media, so I wasn’t able to pass on the request to you, dear reader. The videos were filmed from the handlebar of a cyclist riding on some fairly normal Glasgow roads, and whilst I was staring at the screen Emma was measuring my heart and breathing rates with a variety of leads and straps. For some reason I’d assumed that the videos would be incidents and near misses, but it was just run-of-the mill stuff. Half the videos had nothing of note at all, whereas the other half had some kind of minor hazard like a car parked in a cyclelane, an uphill climb to a pinch point, or a slightly closer than ideal overtake. Every video was tamer than the stuff you could find uploaded daily to Youtube. On reflection, that is of course the point. 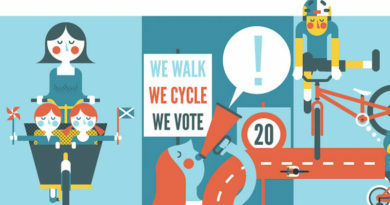 How stressful is cycling in Glasgow, even in the absence of any particular threats? Do experienced cyclists adapt, or just learn to live with that ‘excitement’ of close bus passes, obstructions, and careless driving? Put someone who doesn’t cycle every day in the hotseat, and how nervous does that tipper truck overtake make them? Possibly an unwanted question that Emma would be able to answer; how much does a bad day at work full of coffee and cake elevate my resting heart rate above a healthy level? There was an opportunity afterwards to comment on the videos, where I spent a (no doubt irritating…) 20 minutes explaining how I would have positioned myself differently in the same circumstances. Cycling home afterwards, it dawned on me how ridiculous this was. There was nothing wrong with how the person in the video rode, and yet in every example I would have cycled differently. I’d have taken the lane to prevent overtakes; positioned wider to avoid being clouted by an opened car door; moved out coming up to a road on the left to prompt drivers behind not to left hook. Braked earlier. Ignored the painted cycle lane as it tries to lead me up the inside of left-turning traffic. Getting safely to and from work should not require this level of defensiveness.